Have your team returned to work with enthusiasm and vigour? Or have they come back with a new year’s resolution and a freshly updated resumé? How do you stop your employee looking for a new job? ‘So how’s the job going?’ asks Joe’s aunt over drinks two days before Christmas. ‘It’s fine’ says Joe. He’s been asked that question four times this evening. He’s sick of giving the same lacklustre response. He has time to think while he watches the Christmas movies and takes time away from the normal day to day. He gets wrapped up in ‘what do I want to be different next year’ thoughts that this season inevitably brings. Option One: He puts up with what he has, and gives the same response next Christmas to his well-meaning relatives. Option Two: He can make that bold move to find something new that will take his ‘fine’ to ‘fantastic’. But there is an Option Three. And great leaders should proactively put it into action this January to keep team members they don’t want to lose. How many of your team are turning up today with a New Year’s resolution of finding a new job? If Joe is on your team, you probably don’t want him to take either Option One or Two. Option one gives you a team member that is going through the motions. An employee with inertia is never going to push your business to where it needs to be. At best he’ll keep things ticking over. But chances are his lack of motivation could spread across the team or infuriate his colleagues who are trying to do a great job. Option two leaves you with a hole in your team. One that is expensive and time consuming to fill. Great team members are hard to find. So if Joe is a good one, you want to try to keep him. As a leader, you need to start 2017 by proactively managing this. You have Option Three up your sleeve and it’s time to put it into action. Option Three: Help your team move from ‘fine’ to ‘fantastic’ and keep them in your business. Your goal here is to reignite their excitement in the role and keep them as a motivated member of your team. Strike early and it won’t be too late to save them. First, you need to check the temperature of your team. Who is the flight risk amongst them? Step One: Schedule one to ones with each of your direct reports over the next couple of weeks. Now, you will probably be able to name one or two of your team members that may have lingered in the land of self-reflection over the holidays. The ones that pulled up their resume and updated their LinkedIn account. But there will be others that will surprise you. So don’t assume anything. Schedule time with all your team. What did you enjoy most last year that you would like to do more of? What did you enjoy least last year that you would like to do less of? Are there any parts of the business you would like to get to know better? What about your job makes you smile? Describe what a great day at work looks like? What talents, interests or skills do you have that we are not making the most of? Step Three: Think creatively about how you can make some of these things happen. LinkedIn Talent Solutions surveyed over 30,000 LinkedIn members between January and March of 2016 about why they move jobs. They uncovered some interesting results. You may see these themes in your discussions. 43% leave due to lack of career growth. An immediate promotion is unlikely to be possible. But what can they work on to be ready to apply when the next opportunity arises? How could you give them new responsibilities within their current role? Is there someone they could mentor to develop their leadership skills? What opportunities could you give them to build on their skills? Could you organise a short secondment to another department for them to develop their experience? 35% are in search of more challenges. Where can you give them more autonomy to really make a difference? What can they take on as a project that will make an impact to the business? People love to learn and adapt. Find a way that they can develop their curiosity and experimentation in the work that they do. 29% (a surprisingly low number) are unhappy with their compensation and benefits. Again, immediate satisfaction is rarely possible. But if there is a possibility in the near future, share what they could work on to warrant that pay rise. And before you mention it, I know how long your to do list is as you start 2017. You may not have scheduled time for this extra activity. And this should not all fall onto your action list. Your employee should share responsibility to make this better too. Listen to what they are telling you and put an action list together and assign responsibility between you. Be careful of empty promises here. Words and no action could expedite your team member’s path to the recruitment agent. At the end of the initial meeting, schedule a follow up meeting to discuss next steps. Where possible, find some quick wins. You don’t have a magic wand. Not everything will be possible, and your employee should take some initiative too. 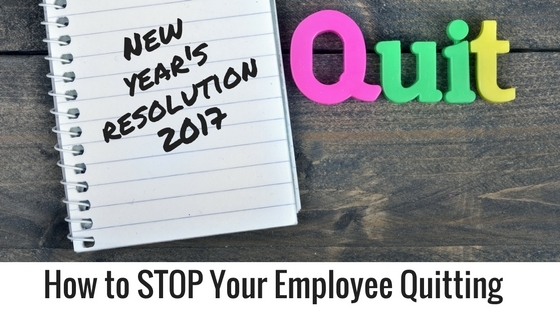 But your desire to make this a great year for your employee may just reignite his enthusiasm for his job. And without real fire beneath them, we all know how New Year’s resolutions can fizzle out quietly in the background.